Prep Time: 25 min. - Cook Time: 1 hour - Total Time: 1 hour 25 min. Bacon Jam: Cook bacon in skillet set over medium heat for 5 to 8 minutes or until fat is rendered and bacon is golden and crisp around edges. Transfer bacon to plate. Reserve 2 tbsp bacon fat. Melt butter in large saucepan set over medium heat; cook onions, salt and granulated sugar. Cook, stirring frequently, for 8 to 10 minutes or until slightly browned. Reduce heat to medium-low; cook, stirring often, for 20 to 30 minutes or until golden brown and caramelized. 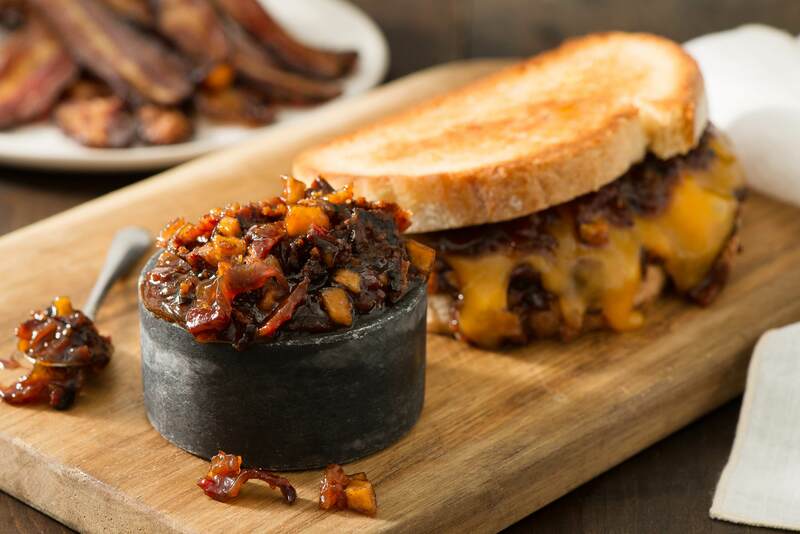 Grilled Cheese: Spread 2 tbsp Bacon Jam on each of 4 slices of bread; top with cheese slices. Cap with remaining bread. Lightly butter outside of sandwiches. Preheat large nonstick skillet or griddle over medium-low heat; cook sandwiches, turning once, for 5 to 8 minutes or until bread is golden brown and cheese melts. Cut sandwiches in half and serve with apple butter. Tip: Use bacon jam on burgers, with eggs or as a stuffing for mushrooms.